Sealaska Heritage Institute (SHI) and the Burke Museum of Natural History and Culture are collaborating on a project to replicate an old fish trap stake collected in Wrangell in the early 1900s by an ethnographer and later acquired by the museum. 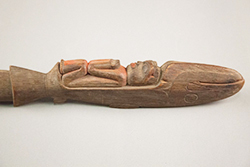 The replica of the stake, which depicts the ancient Tlingit story Aak’wtaatseen (“Alive in the Eddy” in Tlingit), will be carved by master Tsimshian artist David A. Boxley and featured in the institute’s new exhibit, Aan Yátx’u Sáani (“Noble People of the Land” in Tlingit), scheduled to open May 1, 2018. Aan Yátx’u Sáani will include exhibits on ingenious, ancient, indigenous inventions, such as fish traps and halibut hooks, that were essential to the survival of the people. The stake, which is thought to have been made from spruce and was part of an old fish trap found on the Stikine River, was meant to show respect to the salmon and to draw them in. Boxley will begin work on the replica, which will be made of red cedar, on Jan. 6 at the Burke Museum in Seattle during a Northwest Coast Carving Demonstration. After the exhibit, the replica will be added to the institute’s collections. The original stake was collected circa 1905 by George T. Emmons, an ethnographic photographer and lieutenant in the U.S. Navy who documented and collected Native objects in Southeast Alaska from the late 1800s to the early 1900s. The Burke Museum acquired the stake in 1909. The stake depicts a boy inside a salmon and is based on the story Aak’wtaatseen (“Alive in the Eddy”), which is also known as Salmon Boy. The story teaches about respect for the Salmon People, on whom humans depended for their survival. In the story, the title character—a Tlingit boy—violates this value when he flings away a dried piece of salmon with mold on the end given to him by his mother. His disrespect offends the Salmon People, who sweep him into the water and into their world. The boy later returns to his village as a salmon, and after he is caught by his parents, he transforms back into a human. As a human, he teaches people how to properly treat salmon based on what he learned during his time living with the Salmon People. His teachings ensured the salmon would return each year for the benefit of future generations. The stake was incorporated into the trap to symbolize these teachings and to show respect to the salmon. The Burke Museum of Natural History and Culture was founded in 1885. It is the oldest public museum in Washington state and was designated the State Museum in 1899. Its administration resides with the University of Washington College of Arts & Sciences. An active research museum that cares for 16 million geology, biology and cultural objects from Washington state and around the world, the Burke recognizes that the museum sits on traditional Indigenous lands. The Burke holds deep respect for Indigenous knowledge, and is dedicated to collaborating with diverse Native populations, sharing collections and learning together. David A. Boxley is a world-renowned artist known for his spectacular wood carvings. His work is featured as one of three monumental pieces in SHI’s Walter Soboleff Building in Juneau. CONTACT: Amy Fletcher, SHI Media and Publications Director, 907.586.9116; Andrea Godinez, Burke Museum PR Manager, burkepr@uw.edu, 206.543.9762. Caption: Photo of the fish trap stake courtesy of the Burke Museum. Also known as Shanyaak’utlaax (“Salmon Boy” in Tlingit).